Word comes from Humphreys Yacht Sales in Lymington that they are offering a €375,000 price reduction on superyacht Catalyst, a 28m ketch sailing yacht built by Alloy Yachts in New Zealand. Designed by Ron Holland, and built by Alloy Yachts in 1995, she aluminium-hulled and built to MCA LY2 Charter classification. Her accommodation comprises a full-width owner’s suite at the stern, two twin guest cabins (both en-suite), and crew quarters for four in two cabins. Over the last decade Catalyst has undergone a series of renovations, most notably to her engine and machinery in 2009 and to her soft furnishings in 2011. With a water capacity of 3,378 litres, and a fuel capacity of 7,561 litres, Catalyst is a very capable long-distance cruiser. 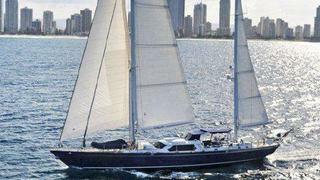 Lying on Australia's Gold Coast, she is currently asking €1,375,000.